Korinky Squash Chijimi – I'll Make It Myself! When I mentioned eating all that squash, you didn’t think I’d leave you hanging, did you? Korinky (konrinkî, コリンキー) is a strange little squash. I bought it without recognizing the name, since many orange squashes are more or less interchangeable, and to my horror, I found no information on it in English other than this page, but apparently these round or football-shaped brindled beauties can be eaten raw! It’s not bad–reminds me of a cross between a fuyu persimmon (color and texture) and a squash. I had no idea what to do with it, so I turned to facebook and Cookpad before settling on this recipe, which I tweaked to suit my palate. 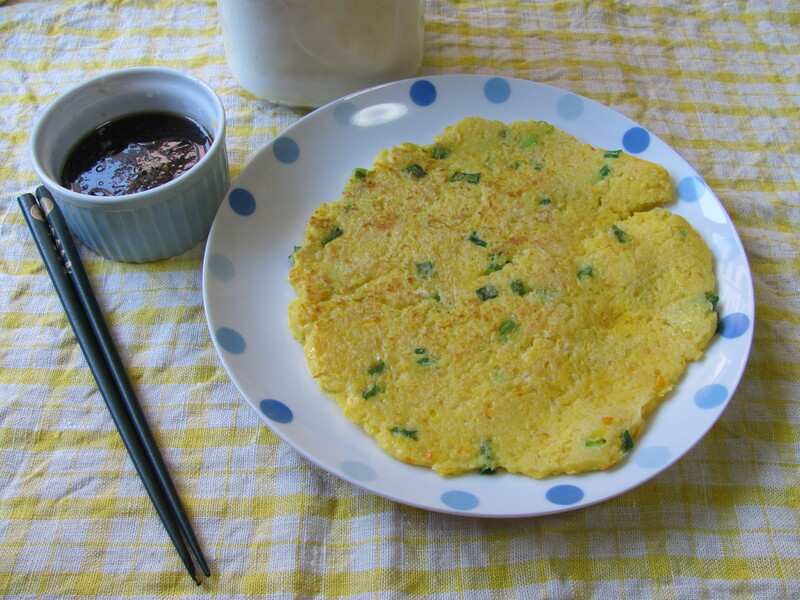 Chijimi, or buchimgae (henceforth not italicized), is a savory pancake, a flatter cousin of okonomiyaki, and is one of the Korean foods that has been integrated into Japanese cuisine particularly Osaka-style cuisine. My host family served chijimi with ponzu sauce, but korinky has a bright citrus flavor, adding more citrus-based ponzu would be overkill (or underwhelming), so this recipe includes a simple sauce made of garlic, soy sauce, sesame oil, and vinegar. Chijimi also makes a good leftovers for bento. See Makiko Itoh’s guide to chijimi on Just Bento for vegan and gluten-free versions of the dough. The actual cooking part of the recipe comes together in a snap; if you don’t have a food processor, you can grate the korinky ahead of time. Yields 2 pancakes. Serves 2. 1. For the sauce, grate the garlic into a small bowl. Add soy sauce, vinegar, and sesame oil. Stir to incorporate and set aside. 2. For the pancakes, wash the squash and remove the seeds, pulp, and peel. Grate. 3. 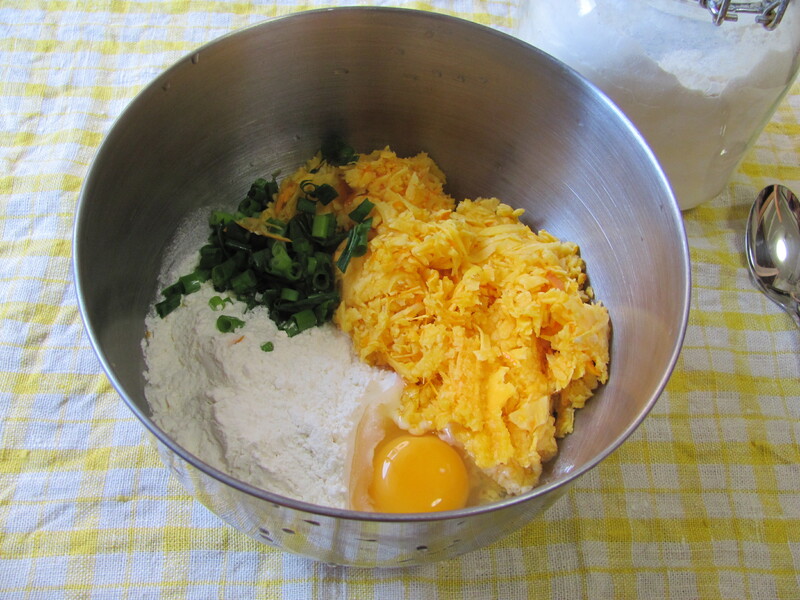 Mix grated squash with the flour, egg, scallion, and water, and stir well. 4. Divide the batter in two. (Using a scale to measure by weight helps.) Heat a small amount of sesame oil in the frying pan over medium-low heat. When the oil is hot, pour half the batter into the pan and form into a large, flat circle. 5. When the edges of the pancake begin to cook through and solidify (about 2-3 minutes), flip the chijimi. Cook on medium to medium-low heat for about 2 minutes on the other side until the chijimi is solid and not raw inside. Repeat for second pancake. 6. Cut into bite-sized pieces. Stir sauce again if separated, then pour sauce on top of the chijimi or use as a dipping sauce. Excellent hot or cold. 7. Store extra chijimi in airtight bags/containers in the refrigerator with the sauce in a separate container for 1-2 days. *I cut 200 grams’ worth of squash, removed the peel, and grated it using the grater in my food processor. If you don’t have a food processor, you could grate the squash by hand or finely dice it; for a different texture, you could julienne it. Looks good! Cookpad is one of my best friends (as is Just Hungry/Bento! 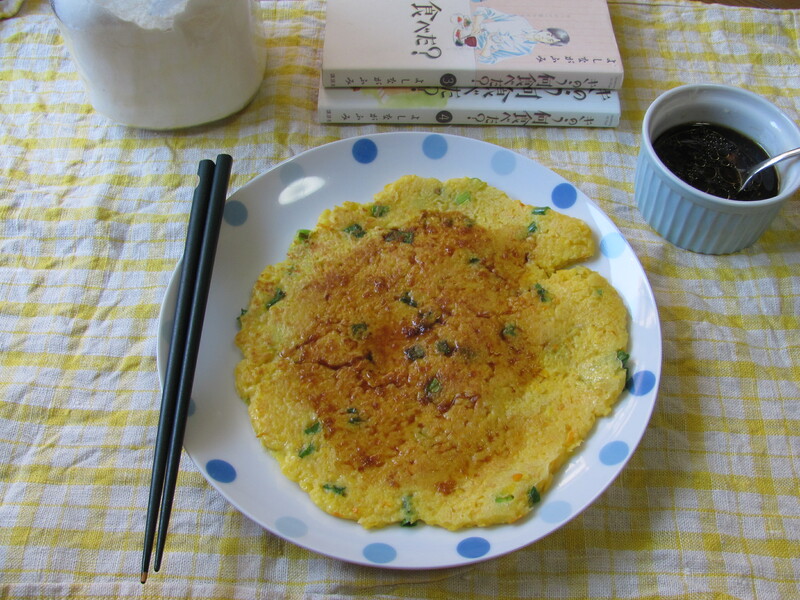 )…I’ve seen a lot of chijimi recipes on Cookpad but have yet to try it. I’ll have to keep and eye out for these in the super, the flavor sounds really unique! Do let me know if you find korinky in Chiba! So far I’ve only encountered in in Kanazawa, but that might be because this year the Noto farms decided to grow ALL the squash. Pingback: Spaghetti-Squash Okonomiyaki « I'll Make It Myself!